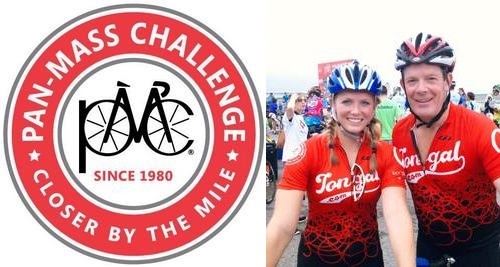 A father-daughter team from Southborough will be among those cycling the Pan Mass Challenge this weekend. Heather and John McDonald will be wheeling across the state for this weekend’s Dana-Farber Cancer Institute fundraiser. Fat Lad at the Back (FLAB) – a British cycling brand are sponsoring a team taking part in the Pan Mass Challenge. Team FLAB, a group of ten dedicated cyclists taking on the 192 mile challenge have named themselves after the quirky British brand who specialise in making cycle wear for people of all shapes and sizes. . .
Heather McDonald, 26 http://pmc.org/egifts/HM0054 and her dad, John McDonald http://pmc.org/egifts/JM0261 are two of the tenacious ten who make up Team FLAB and will join more than 6,200 other cyclists to raise money for the Dana Farber Cancer Institute and this year’s event looks set to bring the total amount of money raised in the organisation’s 39 years to a whopping $650 million dollars. The PMC is America’s most successful athletic fundraising event, raising and contributing more money to charity than any other. Fat Lad at the Back co-founder Lynn Bye said: “The USA represents one of our fastest growing markets globally, we’ve been really well received by our friends across the pond. Cancer has affected many of my friends and relatives so I jumped at the chance to support such a worthwhile cause.” . . . If you would like to donate to their fundraising efforts please visit http://pmc.org/egifts/JM0261. Team FLAB thanks you in advance! If you would like to see the full release with pics, click here. Been a proud sponsor of John’s for years. It’s great to see he and Heather continue raising funds and awareness!